I found this piece to be wise and compassionate. Take care of yourself! I have been giving a lot of thought to those compassionate empathetic people who have had bad experiences where they trusted and gave their heart, where their commitment and loyalty was taken advantage of, and most of all, those who have experienced the psychological tangle of narcissism in their relationships. Primarily, if anyone ever says that you, your behavior, your caring, or relationship caused them to be angry, harm, to behave badly, or abuse in any way, GET OUT! An emotionally and mentally mature person is responsible for their own behaviors and claiming otherwise is the first red flag. My neighbor Van is moving. I was surprised to find myself fighting back tears yesterday when he stopped by to bid farewell. I have several real friends “on the hill” here in New Hampshire, but I’d considered Van more of an acquaintance — the guy who owns the pet cemetery down the road. I had not realized that I actually love the old fellow. Over the years, I’ve spent countless hours sitting on the porch of Van’s little barn chatting about this and that, because that’s what folks up here do. This and that is front and center. Weather, wells, winters, tractors, pig slop, poison ivy . . . this and that. Van occasionally beckons me inside the barn, a country-style man cave, where he offers me a Budweiser and shows me his newest acquisitions, treasures like chicken-slaughtering implements, giant broken freezers that he’s going to fix one day, or burlap bags he’s stitched together to hold turkey feed. We stroll in his garden and he points out what’s coming up and where the bugs have gotten to the squash and would I like some mint and basil? He shows me the latest improvements to his outdoor rainwater shower that he’s cobbled together from plastic pipe and a rusted industrial drum that once held God-knows-what. Every week or so, I hear, “Anybody home?” and there he is at the back door, hands full of fresh eggs, cucumbers, and tomatoes. Occasionally he forgets I’m a vegetarian and brings me fresh bloody chicken breasts which I graciously accept and then quietly pass on to my other neighbors. Because here’s the thing: Van is a conservative. And not just a conservative, but a Trump-loving, NRA-supporting, “live free or die” New Hampshire conservative. The kind I’ve spent my entire environmental career fighting against. And I love him anyway. We tease each other, purposely provoke outrage, and shake our heads at our battling bumper stickers. And we laugh. Van has a glorious laugh. Maybe that’s why I’m so sad that he’s leaving. In the time of trump, I wonder — will friendships like ours ever again be able to take root and grow? Between the darkness and the light lies the truth. Oh, I know, we’re not supposed to talk about truth anymore. Subjective truth is all we’re allowed. Mine lies between darkness and light. turned toward the dark or the light. In Paris, they turned toward the light. In Paris, they saw the truth: the climate is warming. Please don’t tell me about the shadows you see. Political obstruction, elections, sequestration technologies. I don’t want to face that direction, not now. We are standing in the truth. We are facing in the right direction, the light direction. And we are ready to take a step. Re-blogging this perennial favorite. May you be mindful and grateful, whatever you’re eating. Happy Thanksgiving! I like this post from the past, so I’m gifting you with a re-post, and gifting myself with more time to grocery shop, cook, and hang out with friends. Happy Thanksgiving Eve! And remember the wisdom of Meister Eckhart: “If the only prayer you said in your whole life was ‘thank you,’ that would suffice.” Blessings! A guy told me yesterday that he was jealous of me. Not in the traditional sense of the word, like he didn’t want me talking to other guys. Lord knows, I’ve had enough of that in my life. No, this guy said he was jealous of me because I “treasure things up” in my heart. We had been at a retreat where a scripture was read about Mary, the mother of Jesus, treasuring and pondering things in her heart. I’ve never done this before, but I’m going to share a fellow blogger’s post in its entirety. Michelle at the Green Study has long been one of my favorites, and her recent post is beautiful on so many levels. 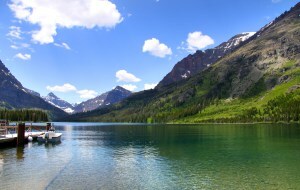 It’s a reflective piece about travel, the writer’s mind, stories, and what’s “true.” She has just visited Glacier National Park, where she pondered nature, true narrative, and the suffering caused by colonialism, expansionism, and war. Anyway, I’m off to my place in New Hampshire in just a few hours, where I hope to get re-grounded in a vague sense of purpose and get some writing done. Enjoy Michelle’s piece! After a vacation in Montana, I’ve returned home, a head full of unorganized thoughts and a vague sense that I’m on the right path again. For months, I’ve been languishing in a purgatory of writer impotence and flailing about for some sense of purpose. We took the Amtrak train from St. Paul to Glacier National Park, staying in a century-old lodge with few amenities and scant Wi-fi. We paid for a view and a convenient walk from the train station. Following our arrival, we spent our days hiking and horseback riding and our evenings playing board games. The Glacier Park Lodge is an attempt to hold onto and faintly mimic a complicated history of land and people. Displays of old photos, both in the lodge and at the railway station reflect a pride in that history. They didn’t tell the whole story.